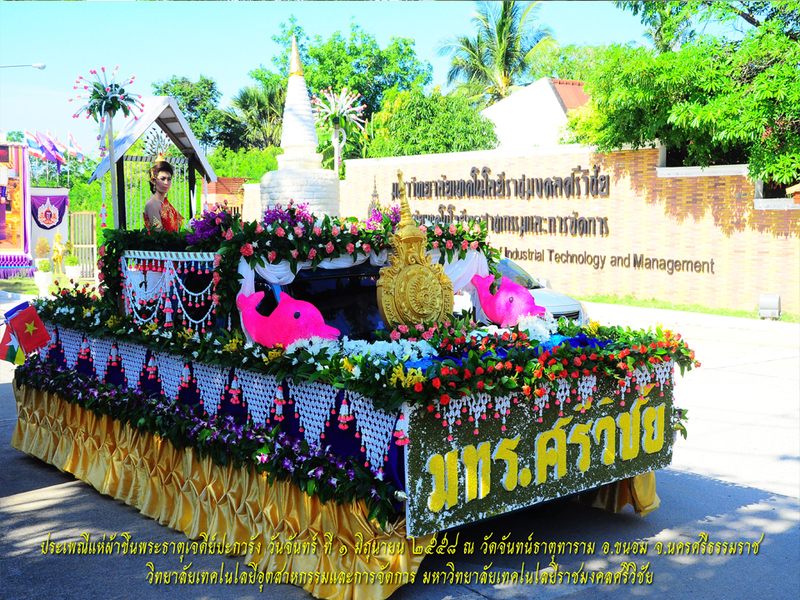 Cultural and Environmental Preservation Division, Student Development Affair, College of Industrial Technology and Management, Rajamangala University of Technology Srivijaya, held “The Khao Coral Pagoda Thart Worship” on the of 1st June 2015 at Chan Tharttaram Temple, Tongnien, Khanom, Nakhon Si Thammarat. Asst. Prof. Dr. Kwanhatai Jaipiem, Director of College of Industrial Technology and Management with her accompanies, lecturers, staff and undergraduate students participated in the Sky-High Fabric Parade to worship the Coral Pagoda in 2015. The parade began with the floral float decorated by College of Industrial Technology and Management. Staff and the students also wore traditional Thai dresses. Over 20 Public and civil organizations participated grandiosely in the parade. The parade length was more than a kilometer. The traditional Buddha fabric was started from the front of the temple to the top of Khaothart Hill.